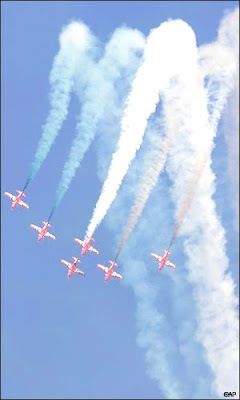 Indian Air Force jets perform at the opening of Aero India 2009 at Yelahanka air base on Wednesday. The inaugural day was marked by a flypast and breathtaking manouveres from IAF's assorted aircraft - Sukhoi-30MKI, Mirage 2000, Jaguar, MiG-21, supersonic jet trainer Hawk and subsonic trainer Kiran and a slew of helicopters. IAF's transport behemoths and air-to-air refuelling aircraft had the spectators in awe with their sheer size and functionality mid-air. With at least 50 official delegations, including many led by their defence ministers and air chiefs, the Indian version of the air show has come of an age to turn into a war theatre for the world's major aerospace firms and global consortiums. Security personnel stand guard as aircraft from different countries are on display at the opening of 'Aero India 2009' at Yelahanka air base on the outskirts of Bangalore. To provide foolproof security and prevent any untoward incident, the venue has been turned into a fortress, with three-tier protective layer, 140 CCTVs, three x-ray machines, radio frequency identification (RFID), 330 defence service corps, 180 air force police personnel as well as platoons of the Central Industrial Security Force and special commando forces. Aircrafts from different countries are seen parked at the opening of 'Aero India 2009'. A dozen global aerospace firms, including the state-run HAL, as well as US and German air forces have flown in their fighter jets, transport planes, a fleet of helicopters and unmanned aerial vehicles for flying and static displays at the event. 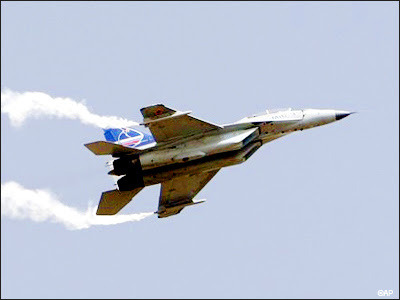 Among them are the American Lockheed Martin with its strike fighter F-16, Boeing with its F-18 Super Hornet, Russian MiG with MiG-35, European consortium with Eurofighter (Typhoon) and HAL/IAF with Sukhoi, Hawk, Intermediate Jet (IJT) and Dhruv. 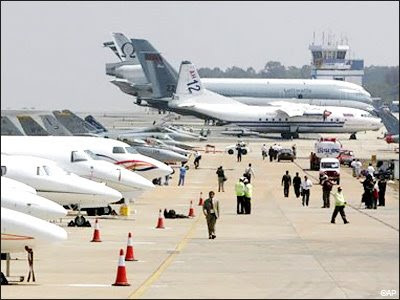 Representatives of different aviation companies are seen at the 'Aero India 2009' in Yelahanka air base. Spanning an area of 44,000 square metres as against 30,000 sq m in 2007, the exhibition area has five international pavilions hosting Australia, Belgium, Germany, Israel and Romania, 54 chalets and about 600 stalls to house international and Indian firms and a host of facilities forming the eco-system. Indian ace shooter and Olympics Gold medallist Abhinav Bindra was on cloud nine Thursday after he flew in US fighter jet F-16IN of global aerospace major Lockheed Martin at Aero India international air show at Yelahanka air base near Bangalore on Thursday. 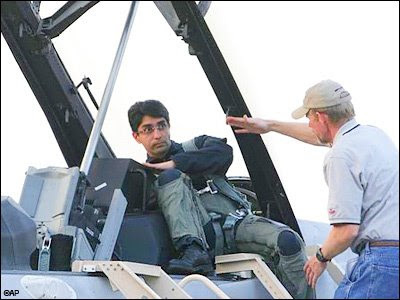 "Most exhilarating experience I had after the Olympics and probably for the rest of my life," a beaming Bindra told reporters after he was flown as a 'co-pilot' by Lockheed test pilot and former US Navy pilot Paul Randall for 45 minutes on board. The Super Viper is touted to be the world's best fighter plane with an unsurpassed performance by veteran air force pilots the world over, the company claimed in a statement. The fourth generation F-16IN is in race for the IAF order floated to induct 126 medium multi-role combat aircraft (MMRCA) into its depleting fleet and as a replacement in phases to the ageing Russian-made MiG-21 fighters. The 26-year-old shooter joins the elite list of Indian fliers such as Tata group chairman Ratan Tata, who flew as a co-pilot in F-16 during the 2007 biennial air show here, and former president A.P.J. Abdul Kalam, who flew in Indian Air Force (IAF) combat aircraft Sukhoi-30MKI in Pune in June 2006. "I salute all those brave men who risk their lives to fly in the air to shoot targets unknown and invisible to them, and all this because they love their country. The F16IN - I believe is a step towards making the lives of these brave men a little easy and make them better equipped miles above in the air," Bindra said after the flight which took him up to Mysore, about 140km from Bangalore. Randall, who piloted the strike fighter, said it was a pleasure to have Bindra as a 'co-pilot' as he picked up everything very quickly. Bindra did not take control of the aircraft. Its World Beauties Show @ Bangalore!!!! Come-on Roger!!!! Yes You Can!!!! All the Best!! !